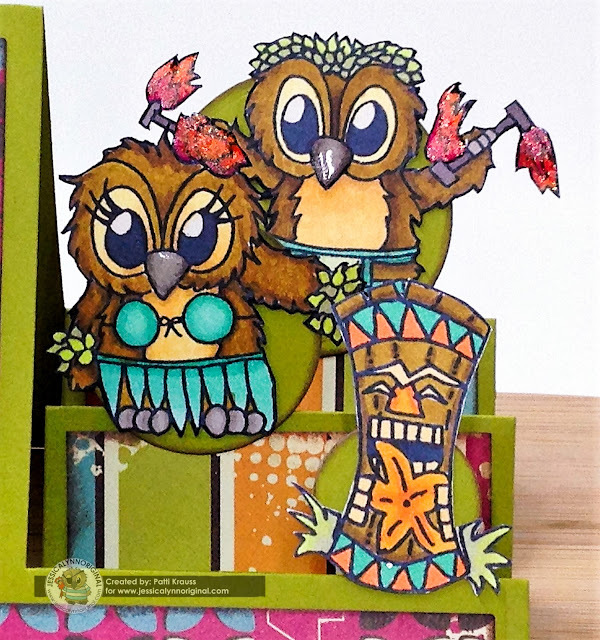 Hi Friends: This week, the JessicaLynnOriginal DT is showcasing the release of the new Tiki Hawaiian Vacation stamp set from JessicaLynnOriginal stamps. This stamp set is available with free shipping until official launch date on Saturday, March 18, 2017. Thanks for joining us for the launch of this stamp set. Hope your day is great and that you take some time to do what makes you happy! Stamp the images onto smooth white cardstock with Memento black ink and color with Spectrum Noir markers. Use the dotting technique on the owls to give them fur-like texture. Fussy cut all of the images and edge with black marker. Add glossy accents and ultra-fine glitter to the fire and hair flower - use just glossy accents on the beaks. For the card base, use the Hearts Step-up Card die with green cardstock to cut the base - fold as directed to make the step-card. Ink the card edges. 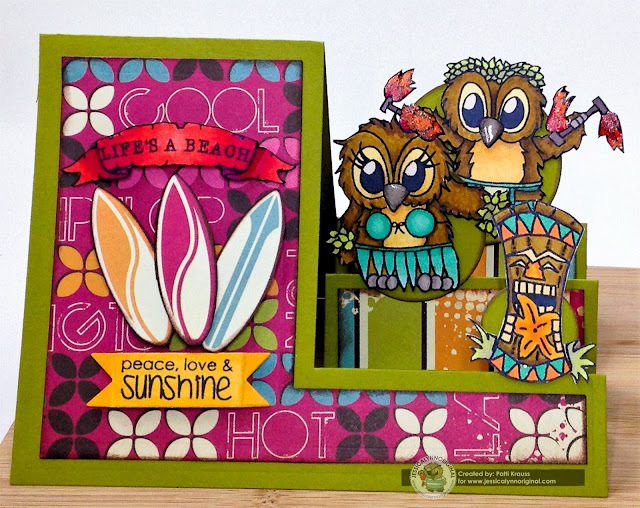 Use the included die to cut the card front panel from the patterned paper, ink edges, and glue to front. Cut smaller panels of the patterned paper to fit the step panels, ink edges, and glue to steps. To hide the hearts, use 3 of the smaller nested circle dies to cut circles from the green cardstock, ink edges, and glue over the hearts. Add the Brentwood owl and Tiki images to the circles on the steps. Fold the edges of the Life's a Beach banner, then add to the card front with foam dots. Fussy cut the surf boards from the paper pack and add them under the banner with foam dots. To finish, cut the Peace, Love, and Sunshine sentiment into a banner shape, fold edges and add under the surf boards with foam dots. This stunning the way you put it together! Love love this! Your projects are all so bright and colorful and beautiful!